The first-ever Panorama festival (July 22-24, 2016), a modern-day World’s Fair of music, art, culture and technology, showcased future-forward creativity beyond the confines of the average music festival experience. META.is conceptualized, curated and produced The Lab, an experience that brought together the best creative technologists in New York City to create an immersive hub for festival-goers. The Lab was Presented by The Verge and powered by HP. THE LAB is composed of three elements: the Façade, the Exhibition, and the Dome. All participating artists are based in New York City, showcasing how the city is truly the center of cutting edge art and technology. With generative and motion-graphic visuals by META.is xDirector VolvoxLabs, the façade encompassed the entire exterior of THE LAB. 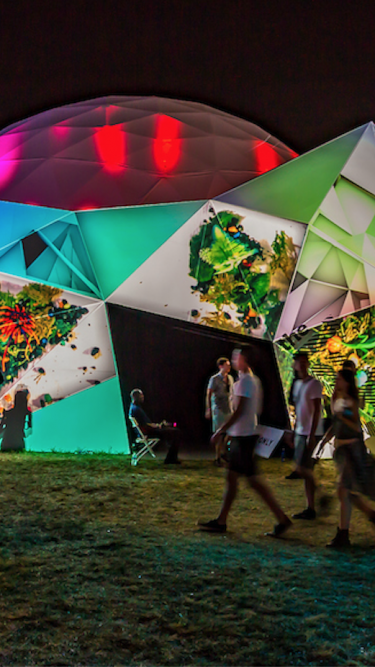 An ultra-high-definition video was projection-mapped onto the surface of THE LAB creating a visual journey throughout the festival. Onlookers stopped to take photos and videos in front of the ever-changing facade, and many danced in front of it, letting their shadows interplay with the projections. The exhibition featured dynamic and immersive art installations by FutureWife, Dave & Gabe, Gabriel Pulecio , Mountain Gods, Red Paper Heart, and Zachary Lieberman.